19.1.1902 à Bâle, 28.2.1972 à Erlenbach (ZH), de Fleurier (auj. comm. Val-de-Travers). Fils de Charles Ferdinand, chimiste, et de Johanna Diemer. ∞ 1) 1939 Katja Wulff (danseuse), 2) 1949 Edith Charlotte Herta Wernecke, actrice. Etudes de droit et de philosophie à Genève et interprète au Palais fédéral à Berne. Scénariste de La faute de l'abbé Mouret de Max Haufler (1937). V. fut producteur et scénariste de "Farinet ou l'or de la montagne" (1938), qui fut un échec commercial et engloutit tout son héritage familial. Acteur dans Le landamman Stauffacher de Leopold Lindtberg (1941). Cabarétiste, il oeuvra au Cornichon (1940), au Kaktus (1943), au Fédéral (1949) et au Grümpelchammer (1959). Avec Alfred Rasser, il rédigea le scénario du film Le soldat auxiliaire Läppli (1960, d'après leur pièce de 1945); il fut acteur dans cinq autres longs métrages suisses. Passeur à la frontière germano-suisse. Membre des brigades anti-franquistes en Espagne, V. fut très lié à Ernest Hemingway. Membre du PC, il le quitta en 1941. Acteur et scenariste suisse. Charles Ferdinand Vaucher, 1902 in Fleurier NE born, moved 1906 with his family to Basel. In Geneva he studied jurisprudence and philosophy and earned his living as an interpreter in the people federation palace. At the same time he attended acting school. The following moving years brought it together also with Louis Jouvet in Paris. His first book "Polly, or the children in the new building" appeared in the twenties. He wrote plays and radio plays. 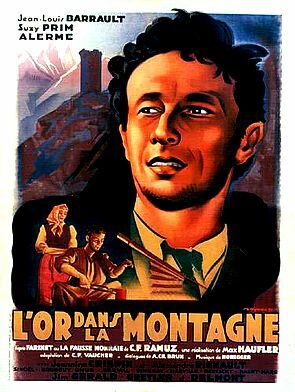 Worked on the script for the film "L'or dans la Montagne" (1939) starring Jean-Louis Barrault. The film was based on a novel by CF Ramuz about "Farinet", a Swiss Robin Hood. At a congress of writers in Madrid he met Ernest Hemingway, with whom he fought against Franco in the international brigades. Back in Switzerland Vaucher lost his entire inheritance, because he invested in the ill-fated motion picture "Farinet". The negative of that film was destroyed during a bomb attack on the film laboratories of Boulongue Billancourt in Paris. In the 1940s, he started and acted in several Cabarets (Cabaret Cornichon, Cabaret Kaktus with Alfred Rasser). He also worked in radio and television. Cooking was a lifelong hobby and he even wrote a cookbook "Herd, du meine Gute". C F. Vaucher died shortly after his 70th birthday on 28 February 1972.